The colder months are on their way but you can be prepared easily with MowDirect. 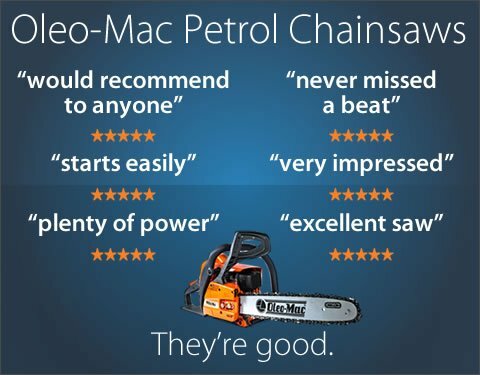 We supply over 100 different models of petrol, electric and cordless chainsaws. In fact it’s the UK’s biggest selection with 15 different leading brands including leading specialist makes such as Oleo-Mac and Tanaka. We have Petrol Chainsaws for every conceivable application from occasional domestic use to professional and forestry. We also supply a superb selection of Electric and Battery Powered Chainsaws with low noise zero-emission motors. Why not check out our exclusive Redback Cordless Chainsaw with it's petrol matching power and ultra low weight. And don't forget, they ALL come with FREE UK mainland delivery. Petrol chainsaws offer the widest choice and we have everything from homeowner & landscaping saws to forestry and arborist models. Cordless chainsaws provide a step-up from electric models and the more powerful models can now offer equivalent performance to petrol-driven homeowner saws. Our electric chainsaws are ideal for sawing up smaller logs for firewood and undertaking minor limbing-work. The best selection of chainsaws, at the best prices, carefully selected to suit your needs and all in one place.